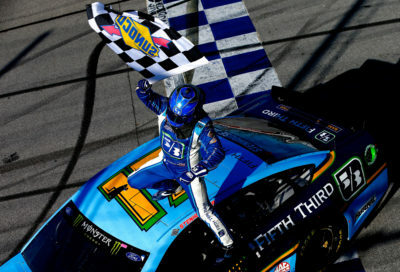 TALLADEGA, AL – MAY 07: Ricky Stenhouse Jr., driver of the #17 Fifth Third Bank Ford, takes the checkered flag to win the Monster Energy NASCAR Cup Series GEICO 500 at Talladega Superspeedway on May 7, 2017 in Talladega, Alabama. Starting from pole Car 17 Ricky Stenhouse Jr. Fifth Third Bank Ford won the 48th Annual GEICO 500, his 1st win in 158 NASCAR Monster Energy Cup Series races. This is his 1st win & 5th Top 10 finish in 2017. This is his 1st win & 5th Top 10 finish in 8 races at Talladega Superspeedway. 2nd Place Car 1 Jamie McMurray McDonald’s $1 Any Size Soft Drink Chevrolet, started from 23rd place posted his 9th Top 10 finish in 30 races at Talladega Superspeedway. It is his 6th Top 10 finish in 2017. 3rd Place Car 18 Kyle Busch Skittles Red White & Blue Toyota, started from 10th place posted his 7th Top 10 finish in 24 races at Talladega Superspeedway. 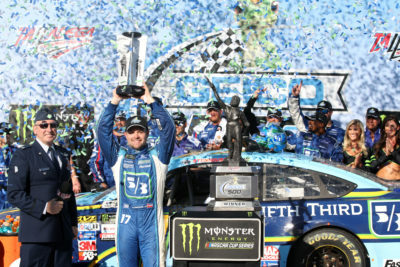 TALLADEGA, AL – MAY 07: Ricky Stenhouse Jr., driver of the #17 Fifth Third Bank Ford, celebrates in Victory Lane after winning the Monster Energy NASCAR Cup Series GEICO 500 at Talladega Superspeedway on May 7, 2017 in Talladega, Alabama. 4th Place Car 43 Aric Almirola Fresh From Florida Ford, started from 22nd place followed by 5th place Car 5 Kasey Kahne UniFirst Chevrolet, started from 19th place. 6th Place Car 41 Kurt Busch Haas Automation/Monster Energy Ford, started from 15th place followed by 7th place Car 2 Brad Keselowski Fitzgerald Glider Kits Ford, started from 3rd place. 8th Place Car 48 Jimmie Johnson Lowe’s Chevrolet, started from 30th place followed by 9th place Car 27 Paul Menard Valvoline/Menards Chevrolet, started from 9th place. Lastly in the Top 10 was Car 38 David Ragan Camping World/Good Sam Ford, in the Top 10, started from 29th place. Ty Dillon (12th) was the highest finishing rookie. 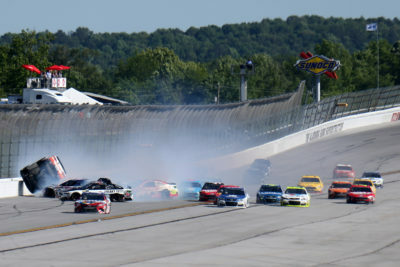 Kyle Larson leads the point standings by 53 points over Martin Truex Jr.
TALLADEGA, AL – MAY 07: Chase Elliott, driver of the #24 Hooters Chevrolet, Erik Jones, AJ Allmendinger, driver of the #47 Kroger ClickList Chevrolet, driver of the #77 ToyotaCare Toyota, Matt Kenseth, driver of the #20 Circle K Toyota, Joey Logano, driver of the #22 Shell Pennzoil Ford, Kevin Harvick, driver of the #4 Jimmy John’s Ford, Martin Truex Jr., driver of the #78 Bass Pro Shops/Tracker Boats Toyota, and Danica Patrick, driver of the #10 Aspen Dental Ford, have an on track incident during the Monster Energy NASCAR Cup Series GEICO 500 at Talladega Superspeedway on May 7, 2017 in Talladega, Alabama. Ford, Car 21 Ryan Blaney Motorcraft/Quick Lane Tire & Auto Center Ford Crash on backstretch. 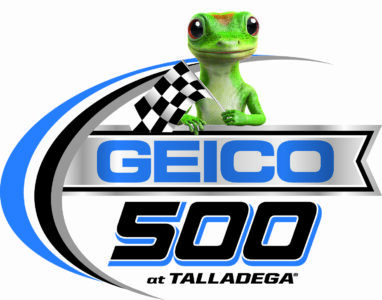 6th Caution on lap 170 for the Big One Car 2 Brad Keselowski Fitzgerald Glider Kits Ford, Car 3 Austin Dillon Dow Intellifresh Chevrolet, Car 4 Kevin Harvick Jimmy John’s Ford, Car 6 Trevor Bayne AdvoCare Ford, Car 10 Danica Patrick Aspen Dental Ford, Car 13 Ty Dillon # GEICO Chevrolet, Car 20 Matt Kenseth Circle K Toyota Car 22 Joey Logano Shell Pennzoil Ford, Car 23 Gray Gaulding # SunFrog.com Toyota, Car 24 Chase Elliott Hooters Chevrolet, Car 38 David Ragan Camping World/Good Sam Ford, Car 41 Kurt Busch Haas Automation/Monster Energy Ford, Car 47 AJ Allmendinger Kroger ClickList Chevrolet, Car 72 Cole Whitt RTIC Coolers Chevrolet, Car 77 Erik Jones ToyotaCare Toyota, Car 78 Martin Truex Jr. Bass Pro Shops/Tracker Boats Toyota, Car 83 Corey LaJoie Dustless Blasting Toyota. 7th Caution on lap 180 for Car 34 Landon Cassill Love’s Travel Stops Ford stopped on track. 8th Caution on lap 187 for the Car 14 Clint Bowyer Haas Automation Demo Days Ford, Car 31 Ryan Newman Caterpillar Chevrolet and Car 37 Chris Buescher Velveeta Chevrolet Crash on backstretch. 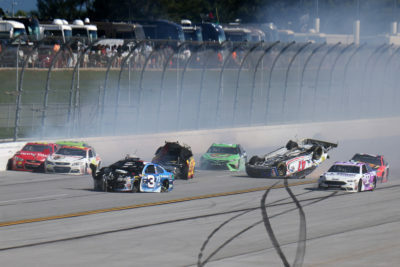 TALLADEGA, AL – MAY 07: Austin Dillon, driver of the #3 Dow Intellifresh Chevrolet, Joey Logano, driver of the #22 Shell Pennzoil Ford, AJ Allmendinger, driver of the #47 Kroger ClickList Chevrolet, Matt DiBenedetto, driver of the #32 EJ Wade Foundation Ford, and Martin Truex Jr., driver of the #78 Bass Pro Shops/Tracker Boats Toyota, have an on track incident during the Monster Energy NASCAR Cup Series GEICO 500 at Talladega Superspeedway on May 7, 2017 in Talladega, Alabama. The race had 26 Lead Changes among 14 drivers: R. Stenhouse Jr. 1-13; B. Keselowski 14-17; R. Newman 18; C. Bowyer 19-23; K. Harvick 24; C. Bowyer 25-27; Kyle Busch 28-33; B. Keselowski 34-57; T. Dillon # 58-60; D. Hamlin 61-80; Kyle Busch 81-83; T. Bayne 84-88; R. Newman 89; C. Bowyer 90-91; D. Hamlin 92-112; P. Menard 113; M. Kenseth 114-117; D. Hamlin 118; B. Keselowski 119-121; D. Hamlin 122; K. Harvick 123-127; J. Johnson 128-130; K. Harvick 131-139; J. Logano 140-149; E. Sadler(i) 150-151; Kyle Busch 152-190; R. Stenhouse Jr. 191;. 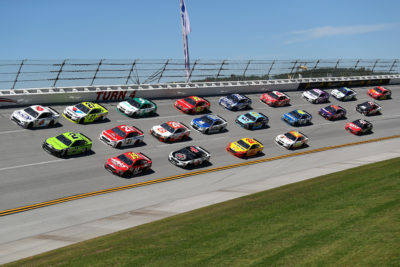 TALLADEGA, AL – MAY 07: Trevor Bayne, driver of the #6 AdvoCare Ford, and Brad Keselowski, driver of the #2 Fitzgerald Glider Kits Ford, lead a pack of cars during the Monster Energy NASCAR Cup Series GEICO 500 at Talladega Superspeedway on May 7, 2017 in Talladega, Alabama. TALLADEGA, AL – MAY 07: Ricky Stenhouse Jr., driver of the #17 Fifth Third Bank Ford, leads the field past the green flag to start the Monster Energy NASCAR Cup Series GEICO 500 at Talladega Superspeedway on May 7, 2017 in Talladega, Alabama. 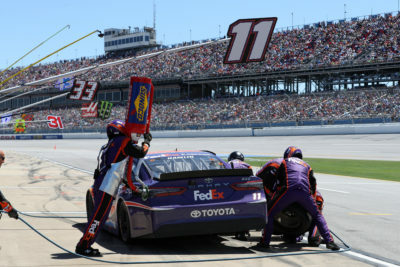 TALLADEGA, AL – MAY 07: Denny Hamlin, driver of the #11 FedEx Express Toyota, pits during the Monster Energy NASCAR Cup Series GEICO 500 at Talladega Superspeedway on May 7, 2017 in Talladega, Alabama. 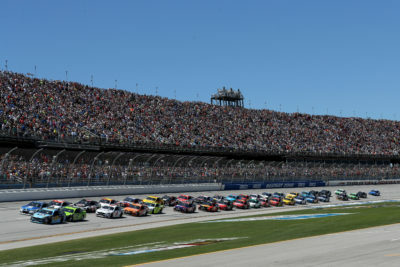 TALLADEGA, AL – MAY 07: Ricky Stenhouse Jr., driver of the #17 Fifth Third Bank Ford, leads the field to the green flag to start the Monster Energy NASCAR Cup Series GEICO 500 at Talladega Superspeedway on May 7, 2017 in Talladega, Alabama. This was an exciting race that ended with a green, white, checker & just when you thought there was not going to be a Big One it happened on lap 170. 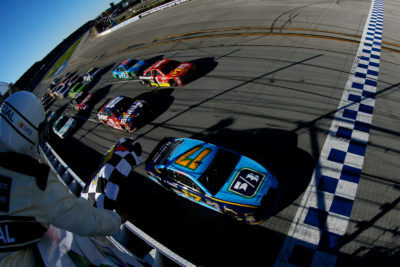 Ricky Stenhouse Jr. grabbed the lead on the last lap from Kyle Busch & was able to stay in front of Busch & Jamie McMurray to win with a Margin of Victory: 0.095 Seconds. What makes plate racing exciting is the high speed with close racing. 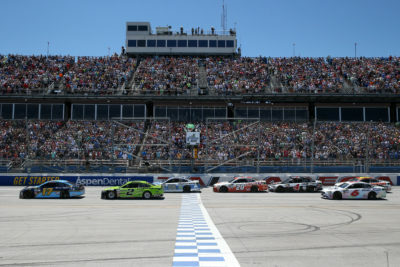 Half way through the race the field was doing 190 MPH within a second of 1st place up to 35th place, 23 cars were on lap 191. The Big One was caused by Car 47 AJ Allmendinger Kroger ClickList Chevrolet bumping Car 24 Chase Elliott Hooters Chevrolet on the wrong angle. TALLADEGA, AL – MAY 07: Ricky Stenhouse Jr., driver of the #17 Fifth Third Bank Ford, celebrates winning the Monster Energy NASCAR Cup Series GEICO 500 at Talladega Superspeedway on May 7, 2017 in Talladega, Alabama. TALLADEGA, AL – MAY 07: Ricky Stenhouse Jr., driver of the #17 Fifth Third Bank Ford, kisses his girlfriend, Danica Patrick, driver of the #10 Aspen Dental Ford, in Victory Lane after winning the Monster Energy NASCAR Cup Series GEICO 500 at Talladega Superspeedway on May 7, 2017 in Talladega, Alabama. Race Comments: Prior to the start of the race, the following car dropped to the rear of the field for the reasons indicated: No. 75 (unapproved tire change). Failed to Qualify: (1) 96 DJ Kennington. Time of Race: 03 Hrs, 29 Mins, 16 Secs. Average Speed: 145.669 MPH. Margin of Victory: 0.095 Seconds. Caution Flags: 8 for 33 laps. Lead Changes: 26 among 14 drivers. Sherwin-Williams Fastest Lap: Ricky Stenhouse Jr, #17. Sunoco Rookie of the Race: Ty Dillon, #13.